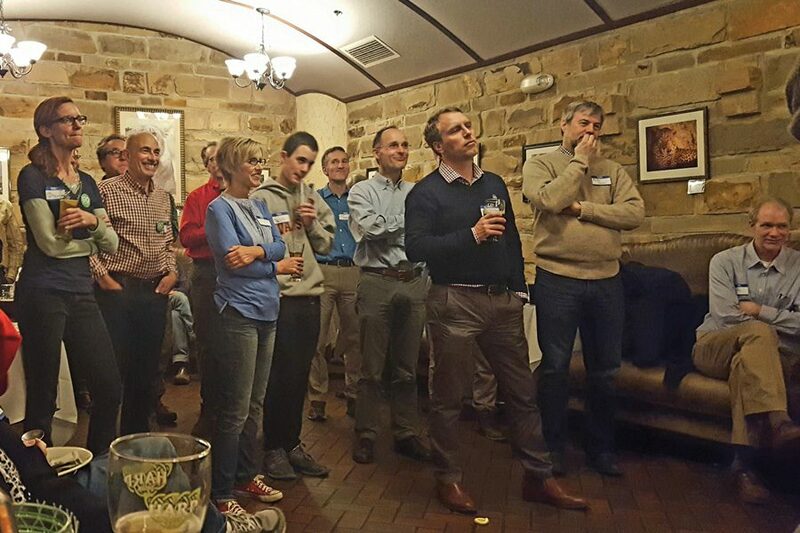 Attendees at a kickoff event for Go Evanston last week. Go Evanston formed to encourage sustainable transportation projects and safety for pedestrians, bicyclists and others in Evanston. A new Evanston group aims to advocate for sustainable transportation initiatives in the city as well as safety for pedestrians, bicyclists and drivers. The group, Go Evanston, was founded in January by a small group of residents and held a kickoff event last week. The group began to form during last year’s debate to remove the Dodge Avenue bike lanes, Go Evanston spokesperson Vickie Jacobsen said. Jacobsen said a group of citizens created a petition in support of the bike lanes that received more than 1,000 signatures. Go Evanston focuses on advocating for an increase in walking, bicycling and public transit use in and around Evanston. The group plans to offer educational sessions on bike and pedestrian safety, and wants to work with city officials and local organizations to achieve its goals. Jacobsen said about 40 people attended the kickoff meeting and discussed the results of a survey Go Evanston distributed earlier this year to receive feedback on the group’s potential goals. The group received about 500 responses to the survey, which helped give the group a sense of direction, Jacobsen said. She added that 275 people have expressed interest in helping out with Go Evanston. The group has partnered with several local organizations, such as the McGaw YMCA and Downtown Evanston. Go Evanston plans on being at the YMCA Healthy Kids Day on April 29 to recruit more volunteers and expand its presence, Jacobsen said. Go Evanston will also work with Citizens’ Greener Evanston, as the membership and missions of the two groups overlap in some ways, CGE president Jonathan Nieuwsma said. Nieuwsma said CGE is excited to work with Go Evanston to reduce the city’s carbon footprint. Evanston Streets Alive, a festival in September along Main Street that highlights modes of transportation other than driving, will bring together Go Evanston, CGE and other organizations, said Katie Knapp, Evanston’s transportation and mobility coordinator. Knapp said Go Evanston will add new perspectives to the conversation on transportation and sustainability. John Hennelly, a volunteer with Go Evanston, said the group is interested in providing resources to people interested in using public transit and possibly providing bicycles to children who cannot otherwise afford them. Hennelly said the group is focused on preventing fatal bicycling accidents in Evanston, citing the September 2016 death of Northwestern first-year student Chuyuan “Chu” Qiu, who was fatally hit by a cement truck while biking on Sheridan Road.